Sagna’s goal – after van Persie hits the post, Arsenal keep possession through Gibbs, and Sagna moves with intent to power home a header from an Arteta cross. Robin van Persie’s shot comes off the post, and Gibbs is first to react. Kranjcar goes to close him down. When Arteta moves to give Gibbs an option, Scott Parker goes out to him, but doesn’t get close enough to stop him doing anything other than advancing forward himself. He is almost encouraging him to cross the ball – risky given how many bodies they have in the box. Arteta clips in a decent cross to around the penalty spot, but look at Sagna – unmarked with Bale marking nobody at the far post. Bale attempts to make up the ground, but Sagna is unchallenged when he makes contact. Bale simply reacted too late. It is a fine header, though, as he has to generate all of the power himself. Right into the corner, leaving Friedel little chance. 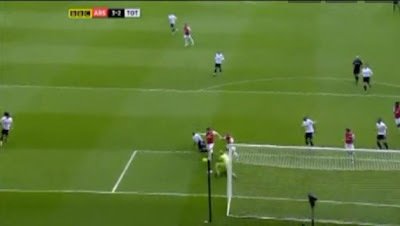 van Persie’s goal – Assou-Ekotto’s weak clearance comes out to van Persie, who bends home an unstoppable finish. As Arsenal pour forward in midfield, their tails up, Spurs look a little desperate. 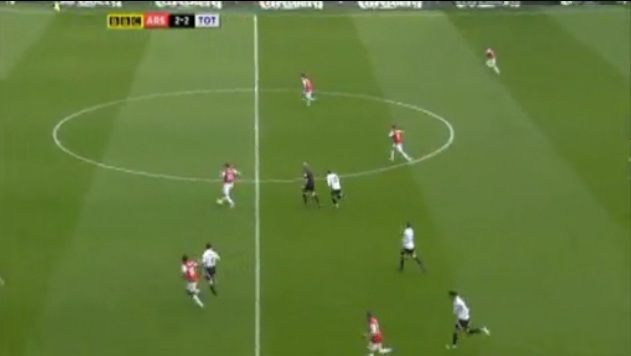 …Kaboul loops a header up, and with two players advancing (and Parker stood still), this could spell danger. It falls kindly for us, but Assou-Ekotto weakly clears with an overhead. The ball falls nicely for van Persie, who has Kranjcar one side of him, and Parker the other. Between Parker and Kranjcar, we fail in stopping him from getting the ball on to his left foot. He really punishes us – bending a fantastic shot into the corner, as Parker lunges for the ball. Too little too late. Rosicky’s goal – Rosicky starts a move and runs beyond King to get on the end of it and nick the ball beyond Friedel. We had already had warnings early in the second half (with Benayoun’s shot), but we continued to throw bodies forward during a very dangerous period of the match. Song plays a one-two with Gibbs, as Sandro also recklessly commits himself a long way up the pitch. As Song receives the ball back, he plays forward to van Persie ahead of Parker, with our entire midfield now out of the game. 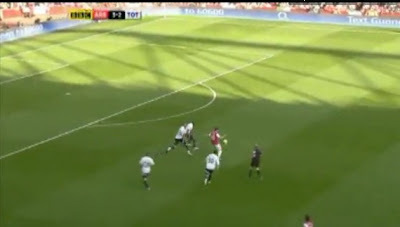 Van Persie moves the ball on to Rosicky, who has no direct opponent on that side of the pitch. He charges forward, with Sagna on his outside, and plays Sagna in. Arsenal have worked a 5 vs 4 thanks to our reckless midfield play. Assou-Ekotto doesn’t get anywhere near close enough to Sagna, although the cross flicks off his trailing leg. Rosicky seems to show more desire to get to the ball ahead of King, who seemed so well-positioned in the previous image. Friedel is also very slow to react, and not brave enough – had he dived at Rosicky’s feet, he may have saved this. Rosicky gets to the ball before Friedel, and lifts it over him. A shambolic goal to concede. 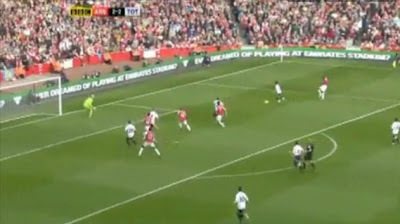 Walcott’s first goal – van Persie holds the ball up, and King and Kaboul seem to have the situation under control, but Walcott makes an unchallenged supporting run, and although he takes the ball wide, he finds a fantastic finish, clipped over Friedel. 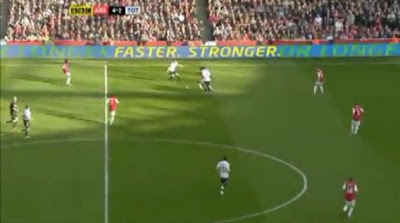 A long ball is played forward, with van Persie the lone front man. We have King and Kaboul in pursuit, and we seem to have things under control. 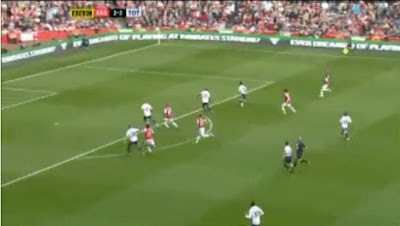 Kaboul almost nicks the ball, but van Persie manages to retain possession. 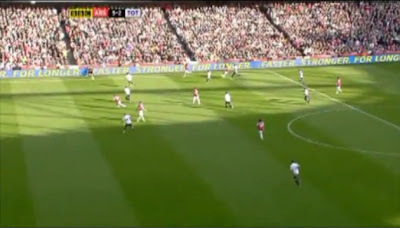 With neither King or Kaboul able to rob him, and all of our other players attracted to the ball, van Persie looks wide. Walcott has made a fantastic supporting run, with Parker unable to keep up with him, and Assou-Ekotto trotting back without any purpose. Walcott, so poor in the first half, does not have the best touch here, and is taken wide. Notice Friedel, though – he seems to be in no man’s land, presumably trying to narrow the angle. In my opinion Friedel makes Walcott’s mind up for him, and he clips it over him effortlessly. Had he stayed on his line, he may have forced him into taking the ball even further wide. Walcott’s second goal – Spurs’ high line is horribly exploited, as Rosicky’s fine pass finds Walcott, and he in turn finds the corner. Song is on the end of a King clearance, and out-muscles Adebayor. Rafael van der Vaart makes a feeble attempt to win the ball, but Song emerges. Modric is too slow to press him, meaning that he has time to get his head up. …and with Walcott having come off the line and running between King and Kaboul, our high line fails. Kaboul is the last man out, but when there’s no pressure on the ball, you simply can’t attempt to play offside in this way anyway. Walcott sprints beyond King and, with his confidence having returned, he takes on an early shot, picking out the corner. Arsenal was the better team and deserved the win. Nice analysis of the Arsenal goals, what about the ones for Spurs? Benoit Assou-Ekotto. Oh My God. Am i the only one who thinks this man is a complete liability ? He keeps going missing, and 3 of the goals were scored where he should of defended, and another came from a poor overhead clearence. He makes me scream, and has single handedly cost us the title. Agreed. I've been saying this for the last 2 years. The man is a liability and we need to replace him. Leighton Baines anyone?? Excellent, if depressing, analysis. Even when we were 2-0 up most Spurs fans did not believe that we were in control. 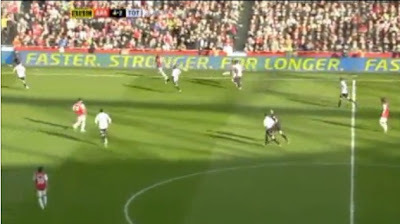 Bale screwed up a pass to Adebayor, opting to take a shot at the near post. It sounds crazy that we needed a third goal to settle us, but that goal would have broken Arsenal. Why HR did not tighten up with Sandro coming on after we were ahead I don't know given what he he has said. He realised that the game was up by halftime, but the team came out and stupidly went gung-ho. In retrospect, Sandro should have come on and the team told to sit tight for 20 mins and press their midfield very hard. I do not know what instructions were given, but it seems that our players were stung out of their hubris and then played in a brainless, headstrong manner: all shape was lost. Football is all about keeping shape; I dont mind if Bale and Lennon switch wings as long as the shape is kept. Once again, our midfield was an open park. Every team that has lost heavily this season has one constant: a weak midfield. We must learn from this and not give up possession and ground against Man U. Forget about winning, we must not lose. Otherwise we are staring into the abyss and this season could be like "lasagne gate". You said Parker was "unable to keep up with [Walcott]", and Assoun-Ekotto was "trotting back without any purpose". You need to go a few seconds further back on the tape. A&E has just put in a decent cross (one of few threatening moments in the second half) after finding space on our left. No wawy he can get back in time to cover their counter attack. 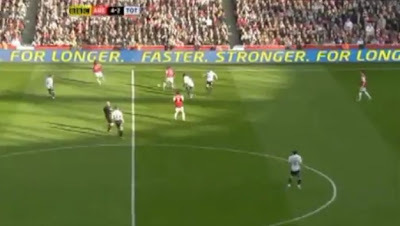 As for not keeping up, when Van Persie receives the ball, Parker is fully 20 metres closer to our goal than Walcott. In stead of covering for his fullback who has moved forward, he is stuck ballwatching, hoping King and Kaboul will win the ball. Had he done his job and covered our left, Van Persie wouldn't have had a pass to make, and there would have been no need to "keep up" with Walcott. A little bit of blame for the center-backs for not stopping RVP, a tiny bit for Friedel for coming off his line, A LOT of blame on Parker for not helping his left back. You firmly nail at least two of our 'untouchables' Parker and Freidel. Parker spent the whole afternoon not quite getting there and then getting himself sent off for a lunge on the half way line. This is the second time that Friedel has conceded 5 and escaped with little of no blame. Bale was pretty ineffecive too at either end of the pitch and dived for his penalty. Difficult to see how a penalty can be awarded and no-one receive a card of any colour. first time in ten years that king has looked vulnerable, and this occured to me while we were 1-0 up.